December was much too slow a month here on Korea & Animation. That's okay, January is full of possibility. There is still lots of good stuff to come, including some stuff promised from the Best of November. Thank you very much for reading this blog! Feel free to give me your input! Learn about Pororo. 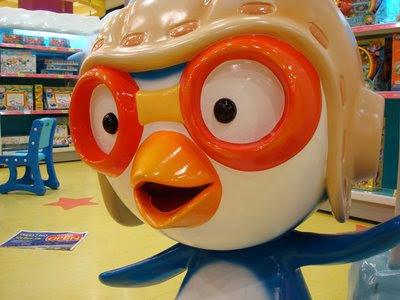 Pororo the Little Penguin is currently one of the most successful Korean animations. I think it's because people just love penguins. Toys R Us is in Korea. 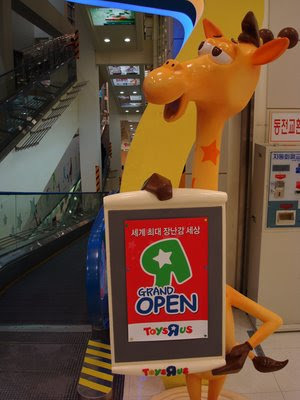 The first Toys R Us in Korea opened last month in Seoul. It is the biggest toy store in all of Korea, ever! A lot can be learned about children's media and culture by looking at the toys available to them. This post may seem cynical, which it kind of is, but don't get me wrong, Toys R Us is a lot of fun! Bee different! 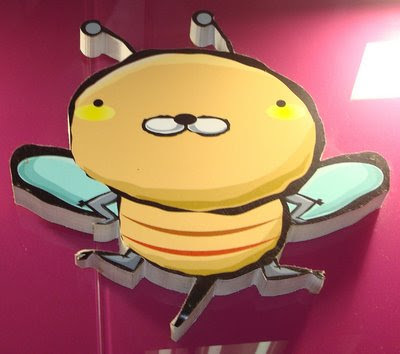 Whoever designed this bee is thinking outside the box! We should be too! 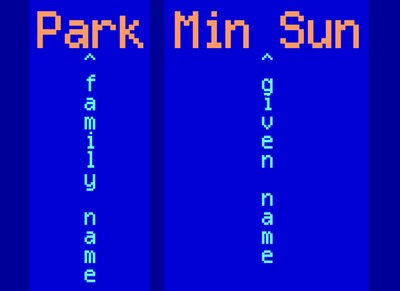 Here's a guide to Korean names. Korean animation is made by Korean people. People are important. Learn how you can get their names right. Hey I tried to get you a gift certificate from the Toys R Us by my house, but it only works for the stores within North America. Also, since the store is so new in Korea, they probably didn't have a chance to update their gift cards. Maybe when they update the system, I'll send you a Toys R Us gift card in American dollars!! Wow, thanks Nug' Knight. I'd rather spend money in the cool small family owned toy shops, though. They have cooler stuff. Is that bee from Toys R Us in Korea? Anonymous, no, it's from 1001 Angyeong Contact, an eyeglasses shop. I don't know much about it.